Beautiful Creatures writer/director Richard LaGravenese went the extra mile when he assembled the cast of his romantic fantasy film. His young leads are unknowns, with very little on their resume, but his supporting cast is filled with respected actors like Jeremy Irons and Viola Davis. In the film, Irons plays a dapper, over-protective uncle, and Davis is a passionate seer. ScreenCrave got the chance to speak to both actors at the film’s press day in Los Angeles. They talked about their roles in Beautiful Creatures, today’s unapologetic generation and the longevity of their careers. Viola, you are a vision in this movie. Your character is like this boho-chic, African beauty with the cool scars on her back. Did you have a lot of say in the way you looked? Viola Davis: Yes I did. Richard (LaGravense) had an idea for the hair, which in hindsight probably would have been an interesting choice, but I thought it was so over-the-top that it would take people out of the movie. I didn’t want my look to be ‘voodoo woman’, but I loved the choice of character. I felt like this whole movie dealt with the past. Amma is much different in the book, but the Amma in the movie, I wanted to know where she came from, who were these ancestors speaking through her. The scars made sense after those questions were answered. I know of scarification and tribal scars so it made perfect sense. I was willing to go with it and not see it as just a general choice that people would make because I’m a black woman. I’m a seer. I like it. Jeremy, Macon is so colorful, in the books and in the film. You can’t quite tell what era he’s from. He’s got wonderful clothes. He carries himself beautifully. What did you see in the script that made you want to be him? Jeremy Irons: I thought there was something weird and a panache about him, a certain enigma, which was interesting. The script didn’t tell me everything about him, but I was encouraged not to read the books. And I didn’t really have time. I came on to the movie quite late. They were already shooting. So I did as I was told. I wore mostly what I was given to wear, and spoke as I was asked to speak. I was aware there are other books, further books, where more is explained about Macon, but sadly, I didn’t have the time to read those three books. I had to ask Richard to tell me about it. It’s not the way I normally do it but there was just no time. Viola, did you read the book? Viola Davis: He refused me to do so. He told everyone, “Do not read the books.” He was absolutely adamant about that. But of course I read most of the book. Then I said, “I cannot be a housekeeper again.” I told him, “I don’t want to see a sponge. I don’t want to have an apron on. I don’t want to wash a dish.” I just think it’s so convenient that every time you see the black character in a movie, they’re in servitude. Viola Davis: Yeah. I get it, but there’s more. But I love the books, that being said. What was it like working with the younger actors? Viola Davis: The number one thing that young people do, especially the ones in this cast, they are so confident and self-assured. More so than what I was when I was younger. At that age I had no sense of myself. This movie is going to be something. Whether it’s going to be like Twilight or Harry Potter, or who knows, but knowing that they were going to put their work out there to be scrutinized and knowing what a big deal this was, they were still very confident. They were aware of it, but not caring about it. That’s the most beautiful part of this generation that they don’t apologize for being who they are. It felt like I spent most of my childhood doing that. That was a lesson for me to learn ’cause I still have a tendency to do that. Where do you think that comes from with the younger generation? Viola Davis: I don’t know what it is. I don’t know if it’s a social media thing. Maybe that’s it. They get to communicate with each other more. So if someone is going through something they put it out there like on Facebook and you’ll 50 million hits, whereas before when you’re going through something you just sucked it up. And because you sucked it up you just felt like you were by yourself and all of that. That’s probably the good part of the social media. I don’t know what it is. Maybe they’ve learned through all of our mistakes. And another thing that I love about this generation is that they’re not as aware of race and differences. I love it. I think it’s fabulous. Do you like the idea that the younger audience is making acquaintance with you? Macon is very protective of Lena (Alice’s character). You have a son (actor Max Irons). Were you overprotective when your son was her age (16)? Jeremy Irons: I think I’m more protective of him now. He’s a fairly successful young actor. He’s coming out in The Host next month. He’s filming a TV series for Starz and the BBC–The White Queen. He’s playing the lead in that. I feel very protective because the industry at the moment has a voracious appetite for young men. In my day it was the Hollywood starlets. They sucked you up and spit you out when they were done with you. And what you have to learn is to have longevity. The business doesn’t care about your longevity anymore. There isn’t a studio system which protects actors. They just use the ones that the audience seems to like and when the audience stops liking them it’s goodbye. I feel protective about him in that way. I want him to be successful. I look at someone like Robert Pattinson and I see the life he’s forced to lead at the moment and I don’t wish that on anybody. Yes, I do feel protective about him. I was surprised when he decided he wanted to be an actor. He was around 17, 18 when he decided he wanted to be an actor. But what you want for your children is for them to have a passion and to be happy. He seems to have both those things. He’s passionate about his work, and he’s very happy doing his work. What do you think about comparisons between Beautiful Creatures and Twilight? Jeremy Irons: Comparisons are odorous. (Laughs) Things are what they are. Of course there’s a certain audience out there who went to see the Harry Potters and Twilights, and of course you want to feed that audience, maybe they’ll like this, I don’t know. I didn’t see any of the Harry Potters or Twilights so I can’t talk about any similarities. What was the funnest part about filming this movie? Viola Davis: This is the first time that I really worked after being a mother so my stress level was at 150. I was trying to find the fun in all of it. But I would have to say– I had to learn Yoruba. It’s a Nigerian language and I learned it because she had to channel her ancestor. I felt that if she was channeling someone in the past, she was a slave, where would they come from and a lot of people spoke Yoruba when you look back at slavery. I thought it was more interesting than Gullah. The Gullah language is in the book. It was fun learning Yoruba. But the fun ended because I had to do it in the swamps and I was afraid that an alligator was going to eat my behind. Jeremy Irons: I try and have fun when I shoot. It’s a fairly tedious process shooting movies. It’s very slow, and I was with a great group of people. Margo Martindale, who plays my sister, made me laugh a great deal. She, Eileen Atkins and I were like the three stooges. In that scene where the table starts to go round and round, we became quite hysterical. That table was just covered with things, food. They stuck it all down, but the table was going so fast that things were still flying around. Eileen was feeling sick because it was going round and round. And Margo was having great trouble staying on her chair. We had a good time. How many takes was that? What was it like to collaborate with Richard? Viola Davis: Fabulous. You look at the actors, and you had Margo Martindale, Eileen Atkins, Jeremy, Emma Thompson, Emmy Rossum–you had a lot of actors that came from the stage. That sounds highfalutin, I know, but I respect that. That doesn’t often happen in film. A lot of times you pick actors who are just popular, and the same could be said of the two leads: Alice (Englert) and Alden (Ehrenreich). Richard chose the best actors for the job. That spoke volumes about him as a collaborator. That’s what we use in the artistic community. (Uses British accent) Collaborator! It helped that he bought me a really great French meal and sat me down with a few drinks and we were able to discuss the character. You almost never get to do that. He’s a beautiful man. Jeremy, I imagine that working with you is daunting for some. What do you do to make people feel at ease with you? Jeremy Irons: I play the fool. In truth we’re all feeling insecure, like we don’t know how to do it, struggling to find the truth of the moment and the character. So you work with each other as complete equals. Very soon actors, even young actors, they see that you’re a technician, you’re a craftsman. You might be older and a little bit more experienced, but that doesn’t always help. Alden (Ehrenreich) seemed to know exactly what he was doing, and Alice (Englert) was working very closely with Richard to develop her character. But if you have to break down that barrier of people being over-respectful, you should just play the fool. Just make jokes and laugh with them. Jeremy, what does a story have to say to you, at this point in your career, for you to invest your time and effort and be away from home? Jeremy Irons: It has to intrigue me a little bit. It has to be something I haven’t said before, if possible. My character has to be within a story that I think is interesting even if I wouldn’t see it, it has to interest other people. It’s the same as ever really but it’s a sort of gut feeling. When you look at a menu and decide what to eat, most of us never think why we chose that. It’s just what we feel like eating tonight. I’m sure it’s made of many things. But it’s difficult to be truthfully accurate about why you chose something. Sometimes you might just need the money. There have been times in the past when I’ve done movies for that reason. I love the honesty of that response. So few say that. But on that, is there a project that you personally are extremely proud of? Jeremy Irons: Lots! I think I’m very happy that I’ve been a part of about 80% of what I’ve done. The other 20% I would like to not mention certainly because I would like them to disappear off the face of the universe. (Laughs) At the time I must’ve done them for a reason. Viola, your look has been your talent the past couple of years. Is this something that you’re consciously aware of? You’re really allowing yourself to embellish now. Viola Davis: I am consciously aware of it, but I’m not doing it because I know people would be consciously aware of it if that makes any sense. I knew that it would be a big deal when I took my wig off. It’s different than just changing your hairstyle when you take your wig off. I always say that the reason I took it off is because I was using my wigs not as an enhancement but as a crutch. I felt that I did it because I was so aware of changing my image in real life that I wanted to counteract what people saw on the screen. I wanted people to say, “Look at me! Look at me! Aren’t I beautiful? Aren’t I beautiful?” But after a certain age that is very unhealthy. I know that actors have to be conscious of their image, but I just felt like that was very unhealthy and it wasn’t really doing anything for me. It’s not like I was going to be rolling around in bed with Tom Cruise, or that if people saw me in this great wig at the SAG awards they were going to say, “Oh you’re so beautiful! Okay we’re going to give you a very Euro-centric role. Who can we team you with? Ben Affleck?” That wasn’t going to happen. So I said, why don’t I just make the most revolutionary choice and just be who I am? You can still roll around in bed with Tom Cruise. Don’t cut yourself out yet. Viola Davis: He wouldn’t be so lucky, you could write that down. Jeremy, is there a film of yours that wasn’t as well-known as other projects that you wish more people would have seen? Jeremy Irons: I just made a picture called Night Train To Lisbon. We’re taking it to the Berlin Festival next week, directed by Bille August who directed The House Of The Spirits. Now there’s a film which maybe didn’t get seen widely as it should have done. I was sorting out my VHS cassettes at home and wanted to see the quality of how the video was and I started watching it and thought it was such a wonderful movie. I made it so long ago that I can now see it very clearly. As an actor it gave me the chance to play a man from the age of 18 to the age of 80. It’s wonderful to play the arc of a life. And see how you change, how you harden, how you soften. Really tremendous. Does it take you a long time to appreciate your work? 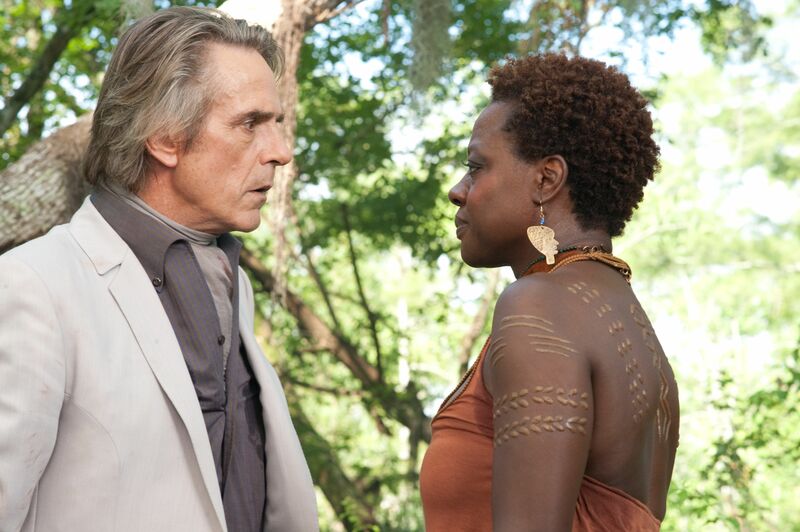 Jeremy Irons: I have to say that I don’t re-watch. It’s very rare. I saw The Mission here in Los Angeles about three years ago. And I hadn’t seen it since we made it, which was in ’85. That was about 25-years-ago and it was extraordinary. I was completely detached from it. I just saw it as a film. And the young man looked very like my son. (Laughs) We also showed Waterland in London last year and that was a film, directed by Stephen Gyllenhaal, that I hadn’t got at the time. When I looked back at it, it was such an emotional story. Wonderful. And I was completely detached because it’s not you anymore. Do you still feel insecure after all of these years? Jeremy Irons: Yes, always. Specially when I’m starting off with a character. I always feel insecure. That never goes. How do you overcome those feelings? Jeremy Irons: You just keep working inside the character until you feel completely at home in this other person. I just played Henry IV on a film which will air on PBS in September and because you have to be completely on top of a fairly difficult language as soon as the camera turns, that was the first time in a long time that I came unto the set and I was absolutely there and completely secure. The cathedral could’ve fallen on my head and I still would’ve been fine. Normally you’re feeling around. You always think you can’t do it. You always feel like a plumber. Jeremy, you underscore a feeling that I have about really great actors, they are less precious with themselves. They are accessible and they continue to work and try. It just speaks to the phrase, ‘The great ones always are.’ And I’m just thinking you’re one of those great ones. Jeremy Irons: You’re very sweet to say so. 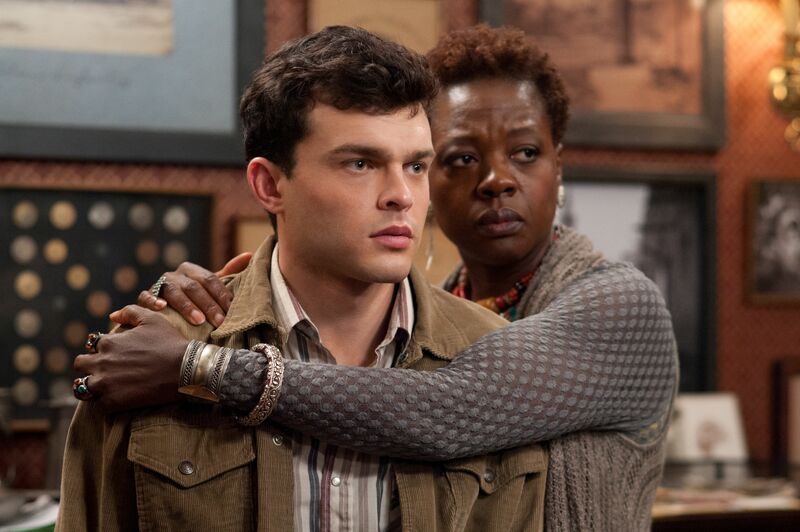 Beautiful Creatures hits theaters February 14.